When buying stock, Stock Calculator can determine the total cash outlay, per share buying price, or number of shares. The user selects which field to calculate and enters values for the remaining fields. When selling stock, Stock Calculator can determine the net profit amount and total return percentage, or the per share selling price. The user selects which field to calculate and enters a value for the remaining field along with the buy information. Stock Calculator can optionally include flat rate, percentage, or per share commissions in the calculations. Taxes on the net profit can also be deducted. Calculations can be saved as documents. Calculation documents can be shared with the Mac OS X and Windows versions of Stock Calculator through iTunes File Sharing. A details view is available to show the calculation line items and subtotals, and can be printed for future reference. 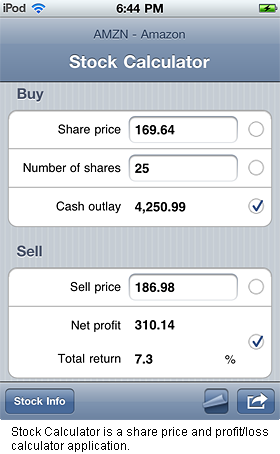 Stock Calculator requires an iOS device (iPhone, iPad, or iPod touch), using iOS 4.3 or later. Stock Calculator for iOS is currently available for $1.99 (USD) from the iTunes App Store, listed as "SSPI Stock Calculator" in the Finance section. System Support Products, Inc. has been a supplier of affordable quality software products for over 30 years, including the ICP Million Dollar Award-winning DeskWorks® Spreadsheet application for IBM minicomputers. SSPI is continuing this tradition in the Apple iOS market with personal applications like Stock Calculator and Key Holder.